Police investigating the deaths of three teenagers at a St Patrick's Day event in Co Tyrone have arrested two men on suspicion of manslaughter. The men, aged 52 and 40, were arrested earlier today and are currently in custody. "Detectives from PSNI's Major Investigation Team investigating the deaths of three teenagers Connor Currie, Lauren Bullock and Morgan Barnard at the Greenvale Hotel in Cookstown on Saint Patrick's Day have arrested two men aged 52 and 40 earlier today, Tuesday 19 March, on suspicion of corporate manslaughter. They have been taken to Dungannon Custody Suite for questioning," said a PSNI statement. 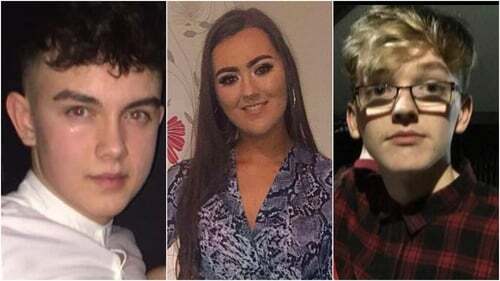 Lauren Bullock, 17, Connor Currie, 16, and Morgan Barnard, 17, from Dungannon in Co Tyrone, died in the tragedy at the Greenvale Hotel in Cookstown. The Police Service of Northern Ireland said it appeared that people had fallen and then been fatally injured, but are still investigating the cause. PSNI Detective Chief Superintendent Raymond Murray told a press conference earlier today that initial investigations indicated that many young people had lucky escapes. The officer said CCTV footage of the tragedy showed young people in the crowd trying to get into the hotel helping others who had fallen to the ground. He paid tribute to them, saying their actions had saved lives. He said the PSNI believes up to 400 people were at the hotel on Sunday evening and has so far traced 160 witnesses. Appealing for more to come forward, he said it agreed with the Public Prosecution Service that anyone under the age of 18 will not be investigated for attempting to enter a licensed premises while under age. "The sole focus of this investigation is to establish how these three young people died," he said. The officer said the crush situation that resulted in the deaths lasted "for several minutes". He said the police investigation will include the planning, management and staffing of the event. Meanwhile, books of condolence opened today in memory of the three teenagers who died. The books of condolence opened this morning at The Burnavon arts centre in Cookstown, at Ranfurly House, Dungannon, and at The Bridewell centre in Magherafelt. One teenager who witnessed the incident outside the disco said it was the most frightening moment of her life. Eboney Johnston, 16, was outside the hotel on Sunday evening. She said: "People just started to fall but as one person fell another went down. "As a person went to lift another person up they were pushing and shoving and another person would fall, which caused a build-up of everybody lying there." She added: "We looked down and you could just see everybody lying there and then you could just see Connor himself being took out. "It was just such a tragic situation. "We are just all so lucky that it was not any of us. "We nearly feel guilty because it was not us, we nearly feel bad, the families, what they are going through, it is awful." Det Chief Supt Murray said: "a number of parents have indicated they are concerned that their children, who may have been underage, were trying to enter a licensed premises". "Talk to your children, reassure them - we know they may be scared - but again I can assure you we are only interested in establishing what happened. Their account of events on Sunday night could be crucial to establishing how Connor, Lauren and Morgan died." Det Chief Supt Murray said some people were concerned about "slightly underage" children coming forward to help with the investigation. At a meeting this evening, the council, health organisations, police, education and community partners met to share information and discuss the co-ordination of support services in place for young people and their families impacted by the Greenvale Hotel tragedy. Speaking on RTÉ's Six One, chair of the Mid Ulster District Council, Cllr Séan McPeake, said that the meeting was "very positive" in getting all the relevant agencies together. "Let’s not forget, that the sheer volume of people that were outside the Greenvale on Sunday evening, they weren’t necessarily from within the district, indeed they were from further afield, and across a number of council areas and a number of health trusts. "We had a very good engagement here this evening, just to make sure that the proper support mechanisms were going to be available for everyone throughout the region," he said. "It’s left a lot of people very traumatised, very anxious, very worried. I met a group of young college students this morning who were in signing the book of condolence. I think even that lifted them (the teenagers) a bit, that they were able to see there was such an outpouring of grief, and to see that they were not alone, and that was the message we were giving today," said Cllr McPeake. "People are traumatised, and not just the young people, but parents. And not just people were there but perhaps those who saw clips on social media." Cllr McPeake added that the tragedy has touched the entire region because so many people would have gone to the hotel in their youth. "Cookstown has a thriving nighttime economy. Literally thousands of people come every week to the various venues. The Greenvale, we went to it ourselves, I brought my children to it through the years too. So the tragedy resonates far and beyond those that were there on the fateful night," he said.